Spaceface’s music video for their single “Spread Your Head” is a hallucinatory, head-first dive into the pysch-rock band’s Merry Prankster-esque adventures. It offers a visually fantastical, mind-bending glimpse of the band’s live performance, while featuring a mysteriously bizarre character called Glowworm, dancing throughout. 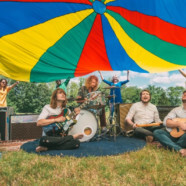 Led by frontman Jake Ingalls (guitarist/keyboardist of The Flaming Lips), Spaceface’s “Spread Your Head” comes off the band’s recent album Sun Kids and is the perfect catalyst for their upcoming tour. The video was produced and filmed by DIY art collective, The Moon, with cinematography and editing by Joe Ashi. Based in Grand Rapids, the company is led by Natalie Wetzel, who has collaborated with Oliver Hibert and done installs in Wayne Coyne’s art gallery,The Womb. Ingalls first met Wetzel at a concert, they kept in touch as each pursued their own artistic journeys. Later, Wetzel turned up at show with an extravagant space-creature inspired costume, which would lead to their involvement with EXTREMEOPHILIA. Given the costume to keep, the band began to involve it in their live shows, which has sparked fan creativity and culture for DIY-creations, seen regularly at their shows. Catch Spaceface live for an auditory and sensory experience like no other; see a full list of dates below. EXTREMEOPHILIA is set to be released later this year, get more details here. Sun Kids can be purchased from the band’s website, or digitally on Bandcamp, iTunes and all major digital retailers.